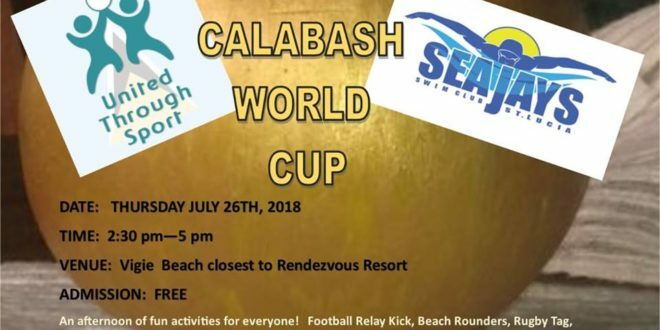 Due to the inclement weather over night and into today, the Calabash World Cup which was originally scheduled to take place at 2:30pm this afternoon at the beach near Rendezvous Resort has been canceled. The activity was organized by United through Sports in collaboration with the Sea Jays Swim Club. The general public is encouraged to follow HTS Sports for further updates. Participants would be broken into 4 teams representing France, Mexico, United Kingdom, and St Lucia. There will be a variety of activities including Beach Rounders, Football Kick Relay, Rugby Tag, Tricky Triathlon and more!